If you’ve been following my income reports for a period of time, you may have noticed that way back when, they started out fairly short and simple. Over time, they have gotten much longer and complicated as I’ve added lots of features and text – in addition to just my monthly numbers. 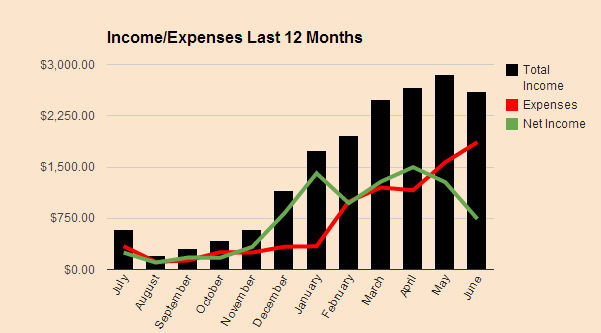 Each income report has turned into an informational blog post, in and of itself! As much as I enjoy writing these longer reports – I need to temporarily get back to the basics and report just my numbers each month. In an effort to vastly increase my income numbers – I’ve decided to completely drop everything and FOCUS on just ONE website until I reach satisfactory success. Feel free to read all about it in this (last) blog post that I wrote (for awhile). Total income $1,632.74 minus total expenses $1,070.04 equals a net profit of $562.70 for November 2015! November turned out to be an okay month. Not great by any means. And it would have really sucked if I didn’t make up for it at the very end with all of the Black Friday to Cyber Monday affiliate sales. Expenses were several hundred dollars more for the month. This is due mostly to paying my writer quite a bit more than a typical month. She worked extra hard and produced a 16,000+ word guide for my ONE Thing site that I am giving away as a lead magnet. I paid her double what I normally pay per word because she put so much extra effort into it and created something really awesome. That expense will WAY more than pay for itself in the long run because I plan on making lots of money with the email list that I am building for that site. What’s Happening with My ONE Thing Site? Buttons in my sidebar on this site do the same thing. Pop-ups appearing ONLY after the user/visitor takes action is key. That’s called the 2-step opt-in process and it works amazingly well. My plan is to use these throughout the ONE Thing site along with the content upgrade strategy for many of the posts on the site. And that’s about where I’m at with the ONE Thing site. Email opt-in forms are in place and now it’s time to promote the site and get links. My plan is to use outreach for promotion and link building – 100%. No scammy or spammy link building strategies whatsoever. Outreach only to get links from real live sites that are current and being run by other people. And yes – I will be using a tool to make the outreach process much easier for me. Check out Ninja Outreach if you haven’t already.